Sushi is a classic Japanese meal made of nori (seaweed), rice and fish. 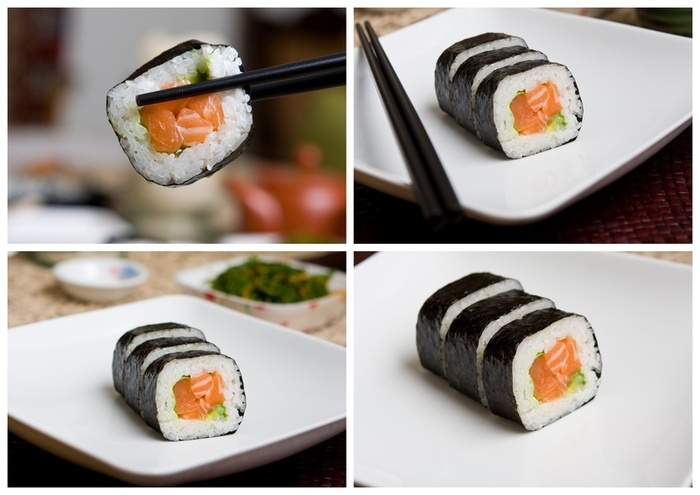 In this article we will be teaching you how to make a salmon sushi roll. Salmon sushi is one of the most well-known sushi sorts, and there are several ways to create this effortless recipe. Make sure you obtain sushi salmon because typical store-bought salmon may not be safe to consume uncooked. The salmon should be cut thinly about 1/4 inch an about 3 inches long. You will also need a good rolling mat as well as sushi rice. 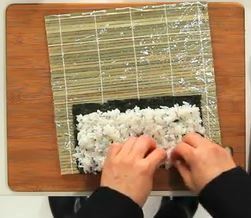 Note that sushi can be made without a bamboo mat, but if you intend on rolling sushi with rice on the outside, a sushi mat is necessary. 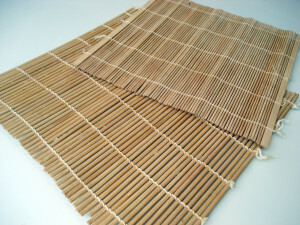 Bamboo mats are pretty cheap to buy and you can find them online or at an Asian store. 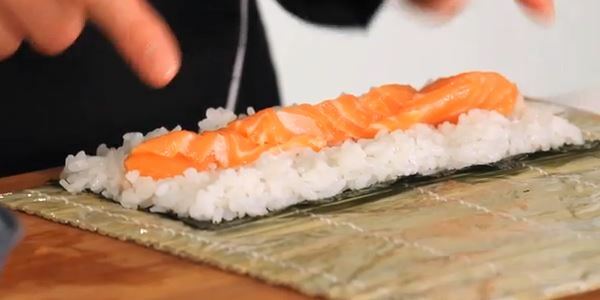 You must use sushi rice or short grain rice because it is stickier along with easier to roll with. Regular rice will not work as it does not have enough starch. First you will need to make the sushi rice. Combine cooked rice, rice vinegar, sugar and salt in a bowl. The amount you want to put in all depends on your personal preference and how many rolls you are making. Mix this until the rice begins to stick to each other. Take a sheet of nori and place it on the bamboo mat, leaving about 1 inch at the edge closest to you. Make sure to center the nori on the mat. Wet both hands with cool water to ensure the rice does not stick to them and pick up a handful of rice. Place the rice in the center of the nori and use your fingers to spread it consistently on the nori, leaving less than an inch of the nori uncovered on the side furthest from you. Notice how in the video they are not using regular salmon. You have to have special salmon that has been kept under certain conditions in order for it to be safe to eat raw. Do not eat raw salmon if it is not sushi grade or you might get sick! Cooked salmon is fine however. Once the rice is distributed evenly, place the salmon in a line parallel to you on the rice. Place it closer to you although not at the very edge. Do not overfill the sushi roll; the fillings should just be about 1/2 inch in diameter. Lift the mat on the edge closest to you. Using your fingers, hold the contents in place as you roll the mat over until you have got a cylindrical shape. Press lightly but firmly, using the rice to hold the shape. Continue to move the sushi using the mat until you have reached the 3/4-inch nori at the end. Take away the mat and use your fingertips to seal the sushi roll. Slice the sushi roll in half, then slice the halves into thirds, making six rolls. Continue doing this process with the remaining ingredients you have left to make as many rolls as you wish. This roll is just a plain salmon roll. You can put anything else in it if you would like. Another popular roll is salmon avocado. Sushi is generally served with soy sauce, wasabi and pickled ginger on the side. So if you want a real sushi experience do not forget to place it on the plate! With that said, break out those chopsticks and enjoy your freshly made salmon sushi roll.